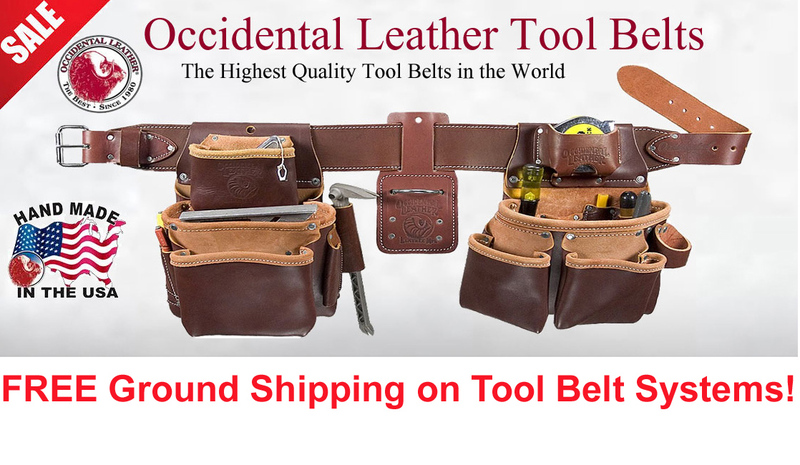 Highest quality Tool Belts and Tool Bags. This Left Handed Tool Belt System incorporates Leather and industrial nylon intelligently combined to lighten the builder\'s load. The NoSpill™ system features all leather, hand specific tool holders. FeaturesDesigned with Hand Specific Tool HoldersPadded Two Ply Tool Bags Keep Their ShapeExtremely Abrasion Resistant Industrial NylonLeather Tool Holders and Corner ReinforcingMade in USA! For more than 30 years, the Pro Framer™ has been the benchmark by which all other tool belts have been measured. Designed by and for the professional builder, this traditional belt set is fine tuned for optimum efficiency and comfort. The Pro Leather™ Series is constructed of premium top grain cow hides tanned to stringent specifications with a special blend of oils and waxes that meet the demands of heavy outdoor use. This is a tool belt system for Left Handed people.This Framing Set is ideal for the carpenter that prefers the tape holder on the right side and double outer pouches on the left side. Classic leather framing bags (5060 fastener bag and 5017DB tool bag). Features a removable High Mount Hammer Holder (5059) on rear. Constructed of rugged commercial nylon and high-density neoprene padding with extra wide hip areas. Employs a unique nylon cross over system that provides an adjust to fit feature that locks into place. A fully adjustable tool belt which provides one belt for all seasons and provides a full range of adjustment. Fixed bags don’t slip around. 1550 Stronghold® Insta-Vest™ Kit Plus Suspender Pkg. Insert in any tool pocket for extra protection and smooth access.This 2" x 6" polypropylene shield helps protect your bags from sharp tools. Order extras to outfit your vest or tool bags. Compact vest tool carrying system, loaded with tool holders and pockets. Comes with one 2003 Pocket Shield™ (for sharp knife or chisel)!Can be worn as an independent vest tool carry system. Ideal organization; ergonomic design, even load distribution, total freedom of movement!